We have created this guide to help players of all skill levels pick the best possible paddle based on their style of play, their physical attributes, and their experience level. This guide is broken down into seven major sections, each devoted to specific topic. If you wish to jump direct to a particular section, click on the links below and they will take you directly to that section of the page. We sell over 80 different types of pickleball paddles. Sorting out what paddle is best for you can be a bit overwhelming! The best way to narrow the choices is to try out various paddles, but for many of our customers that option is not available. So, here are three key considerations for everyone considering what pickleball paddle to purchase. #1 Price. Good composite pickleball paddles start at $50. There are three categories of paddles - wood prices range from $13-$36, composite from $45-$145 and graphite from $60- $145. Note on wood paddles - Wood paddles are the least expensive, however they are super heavy paddles with a solid plywood core. They don’t provide the wonderful pickleball POP that players love. After playing with the wood paddles and testing out other players' composite paddles, our customers often call us to place a second order for a composite or graphite paddle. If you're new to pickleball and looking for your first paddle, go for an inexpensive composite or graphite paddle right away. #2 Weight. Weight is the most important factor when choosing a paddle. Pickleball paddles can range from 6 to 14 ounces. Most composite or graphite paddles weigh from 6 to 9 ounces. Weight influences how a paddle feels when you pick it up and swing it on the court. For someone without pre-existing injuries, your choice of paddle weight is entirely up to your personal fitness level and comfort. A heavier paddle will help you to drive the ball, but will provide less control of the ball. However, be aware that the heaviness of the paddle also accelerates fatigue in your arm, and can strain your elbow. Conversely, a paddle that is too light may not provide enough drive but will increase ball control. #3 Grip Size. It is important to play with a paddle that has the correct grip circumference for your hand. Playing with a paddle grip that is too big may cause the paddle to slip in your hand and can lead to elbow problems. For this reason if you are trying to decide between two sizes, try the smaller size first. Smaller grips allow for more wrist action, which aids in putting spin on the ball and enhances control. This wrist action also produces powerful serves, and facilitates quick hand changes for those players that switch hands during play. A larger grip will provide more stability, and be easier on your arm, so you can see that it is important to find the "just right" size for your hand. Competitive pickleball players often customize their paddle grips using an over-grip to re-wrap their paddle exactly to fit their personal preference. Almost all paddle grip sizes are between 4 to 4 1/2 inches in circumference. Like tennis, pickleball grips are broken down into 1/8 inch increments. 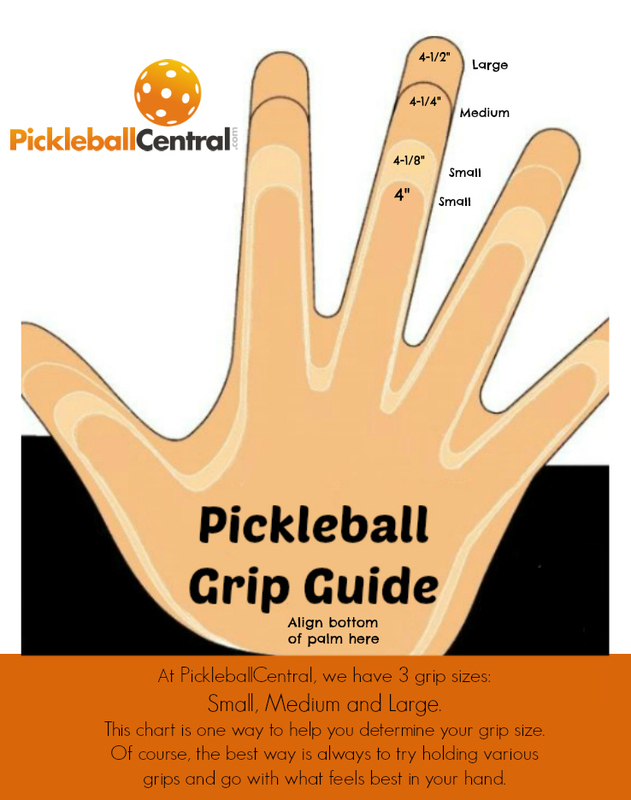 At PickleballCentral.com we have evaluated each line of paddles and distinguished the grip sizes by the 1/8 inch. The most common grip sizes are 4 , 4 1/8, 4 1/4 and 4 1/2 inch circumference. Weight is probably the most important factor when choosing a paddle. Weight influences how a paddle feels when you pick it up and swing it on the court. For someone without pre-existing injuries, your choice of paddle weight is entirely up to your personal fitness level and comfort. Pickleball paddles range from six ounces to 14 ounces. A heavier paddle will help you to drive the ball, but offers less control of the ball. However, be aware that the heaviness of the paddle also accelerates fatigue in your arm, and can strain your elbow. Conversely, a paddle that is too light will not provide enough drive, may be difficult to support in your hand, but will increase ball control. If you have arthritis, "tennis elbow" or an injury to your hand, elbow or shoulder, we recommend you select a middle-weight paddle between 7.3 and 8.4 ounces. This will be heavy enough to provide stability and absorb shock, yet light enough not to tax your arm. Weight is probably the most important factor when choosing a paddle. Weight influences how a paddle feels when you pick it up and swing it on the court. Do not go too heavy. For people with hand, elbow or shoulder conditions, swinging a paddle heavier than 8.4 ounces could inflame your injury or arthritis, especially during fast twitch type reactions when defensively blocking and volleying where you are quickly moving your paddle to defend and block or attack a volley. For this reason, most all wood paddles are out of consideration. We have also had a lot of teaching pros encourage players to not go too light. We consider a light weight paddle to be any paddle under 7.2 ounces. A light weight paddle will require you to put significant energy, swing and momentum into each contact with the ball, and there is less mass in the paddle to absorb energy and vibration. Players who use lighter paddles need to swing harder to put energy into their shots, putting more pressure on their joints. The biggest advantage of a lighter paddle for injury is in fast twitch situations where you quickly move a paddle to block and defend, and this is where a lighter paddle or a paddle that is handle biased in balance can help. There is a point of diminishing return, where with ultra light weight paddles, the weight of the paddle will not help you drive the ball. It is like playing pickleball with a feather. In 2018 we saw the advent of the first pickleball paddle designed specifically to address injuries by reducing the amount of shock and vibration transferred from the paddle to your arm. ProKennex Paddles have taken their Kinetic Energy Management System popular in tennis and developed a line of pickleball paddles that dramatically reduce the amount of vibration energy passed through the handle and into someone's arm. These paddles play with a lot of power, so you as the player don't need to swing as hard to execute your shots, and when you do strike a ball, the type of energy (and it's vibration) is minimized to he point where it dampens (reduces) the shock placed on your joints. Click here to learn more about ProKennex Kinetic Pickleball Paddles. This informal test is supposed to work for both men and women. It's simple and works for the people we've tested. Remember, if in doubt, go with a smaller grip. Click here to learn more about the effects of an ill-fitting paddle. Hold your dominant palm up. Notice your palm has three major creases. Take a ruler and measure from the middle crease of your palm, up to the tip of your ring finger. This measurement should reflect the perfect grip size for you. If you are unsure between two sizes, choose the smaller size. Here's an easy, print-out chart we designed to simplify the task of determining your grip size. Print it out and determine your approximate grip size. To verify the fit of your paddle, or when trying several paddles, use the following method to verify sizing. If you are unsure between two sizes, choose the smaller size. Here's why. Grip a paddle with your normal grip and see if you can slide the index finger of your other hand between your fingertips and the heel of your hand gripping the paddle. Your finger should fit snugly between the two without having to move your fingers. If you must shift your fingers farther away from the heel of the hand to get your index finger in between the two, the grip might be too small. If you have space between your index finger and your fingers or heel of your hand, the grip might be too large. 1. How do I pick a paddle? There are so many choices! The best way to select a paddle is to try them out! Ask your fellow pickleball players if you can test-drive their paddles. Try various weights and grip sizes. If you find a paddle that feels good and balanced in your hand try to get that paddle’s weight. We will hand weigh paddles to match the weight that you are seeking. If you don’t have access to a wide variety of paddle to test, our Paddle Guide is a helpful tool to narrow the choices. 2. I’m buying my first paddle, any advice? Your first paddle should have a classic pickleball paddle shape. You can add specialty paddles once you have a great classic paddle in your bag. The classic paddle is approximately 7 ¾ - 8 inches wide and 15 ½ - 15 ¾ inches long. Most of the paddles we sell are classic-sized paddles. 3. What’s the difference between fiberglass and graphite paddles? Fiberglass paddles often weigh a little more that graphite paddles. Because they are a little heavier than graphite paddles, fiberglass paddles are considered to have more power. Graphite paddles are considered to have more control or finesse. Both graphite and fiberglass paddles are lightweight and strong. There is a general perception that graphite is better but no one has studied if there is a difference in how the ball comes off a graphite vs. fiberglass paddle. 4. Why do so many composite paddle have a over lapping edge guard? You’ll find an edge guard around the edges of a most composite paddles. The edge guard maintains the integrity of the paddle and provides a covering to the open honeycomb interior. Without an overlapping edge guard there is a risk the paddle will de-laminate, and be ruined. If a paddle de-laminates, the face of the paddle will pull up from the honeycomb interior, destroying the paddle. 5. How do I find a paddle with power? Looking for more power? Select a heavy-weight or super-heavy-weight paddle. Power is all about weight. The heavier the paddle, the more power you have. 6. How do I find a paddle with more control? Looking to improve control? Select a light-weight or middle-weight paddle with a smaller head size. Control is all about maneuverability and quick responses. Be lighting-fast with a lighter, smaller paddle. 7. How long should a paddle last? How long a paddle lasts depends on how you care for it and how often you play. Top-notch players who play daily usually expect to retire a graphite or composite paddle after about one year. For people playing a couple of times a week, a paddle should last around three years. Wood paddles are extremely durable and will last many years. 8. How do I find a quiet paddle? My neighbors don’t like the happy pickleball pop. Shhh! The results of one sound study found the following paddles are quiet: All wood paddles also, Paddletek, Revolution, Power, Enforcer, Spikes Graphite, Spikes Contour Composite and the Z5 Composite. 9. What is a “Sweet Spot”? All paddles will have some sort of "sweet spot" in the center of the hitting surface, regardless of the dimensions, as does a tennis racquet, baseball bat, or table tennis paddle. It's a matter of physics, nothing else. The key is to hit the center of the paddle, which takes practice and coordination. 10. Are there indoor and outdoor paddles? Paddles are not made specifically for indoor or outdoor play. Balls are made specifically for indoors or outdoors, but not paddles. 11. Are there men’s and women’s paddles? Paddles are not made specifically for men or women. Paddles are gender-neutral. 12. I’m a former tennis player, what paddle should I choose? Former tennis players or racquetball players often like a paddle with a longer handle like the Enforcer, Power or Elite paddles. The longer handle enables a two-handed backhand and more room for quick hand switches. 13. What difference does handle length make? Longer paddles handles, such as those five inches or longer, provide more reach on ground strokes, added leverage on serves and slightly more power overall. Paddles with longer handles include: Aero-D, Enforcer, Evoke Teardrop, Venom, Power Play Pro, Power, Ace II and Dillers. 14. What is Paddle Deflection? 15. How do I Check the Fit of my paddle? Grip a paddle with your normal grip and see if you can slide the index finger of your other hand between your fingertips and the heel of your hand gripping the paddle. Your finger should fit snugly between the two without your having to move your fingers.